On Saturday, March 24th Malden Rotary hosted the 17thannual Malden Rotary Road Race which had two distances, a 5K and a 10K, run through the streets of Malden via various neighborhoods. One of the highlights of this year’s race was when the organizers recognized their “Volunteer of the Decade” Stephen Winslow. 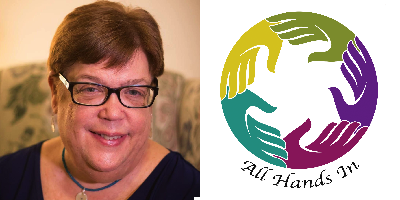 Barbara Anderson from All Hands In will be Guest Speaker at Malden Rotary luncheon on Wednesday, September 27th. Human trafficking will be the topic. The Malden Rotary lunch meeting starts at 12:15 pm at Anthony's of Malden, 105 Canal Street. We had a great day at Malden Rotary. President Mark Lawhorne presented new member Marc Gattineri with his Certificate of Membership and also presented Secretary/Treasurer David Hart with a new Paul Harris Fellow Pin. This was David's third Paul Harris Fellow recognition, thus the pin is adorned with three sapphires. Members of the Rotary Club of Malden attended the District 7930 celebration of the Rotary Foundation's 100th birthday this past week. 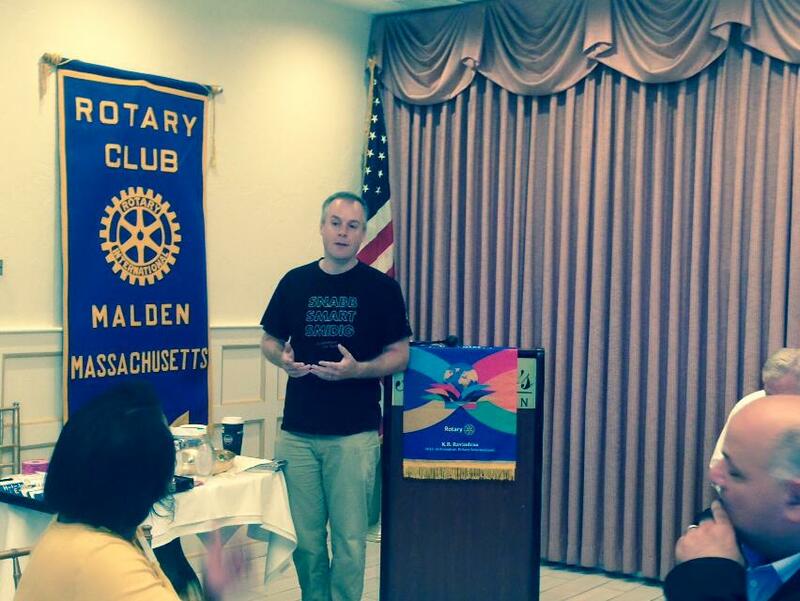 Kevin Duffy was Malden Rotary's Guest Speaker on August 17th. 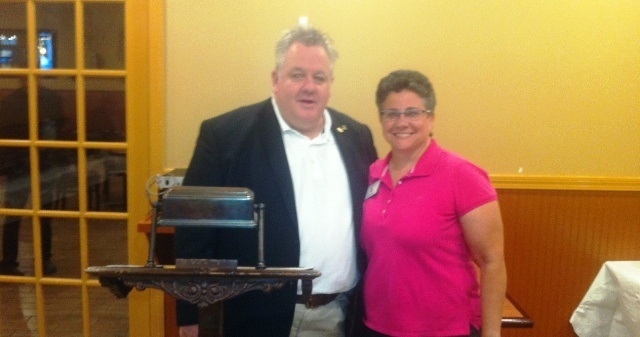 Malden resident and author was the guest speaker at the Rotary Club's weekly luncheon on Wednesday, August 3rd. Mike Munger's story is that of a lifetime of Service Above Self. Mike is a retired Watertown Police Detective, Malden resident and forever a Marine. While working in Watertown, Mike took a year long leave of absence and joined the United Nations on a mission to Kosovo to help teach police procedures to in the war torn country. Upon returning Mike wrote a book loosely based on his experiences overseas. 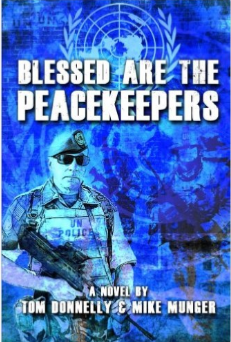 His book, Blessed Are the Peacekeepers, was written about his alter ego Mike Granger. Once retired Mike was looking to continue to serve his community and found himself volunteering and teaching Police Procedures in the U.S. Naval Sea Cadet Corps in Boston at the U.S. Coast Guard Station. 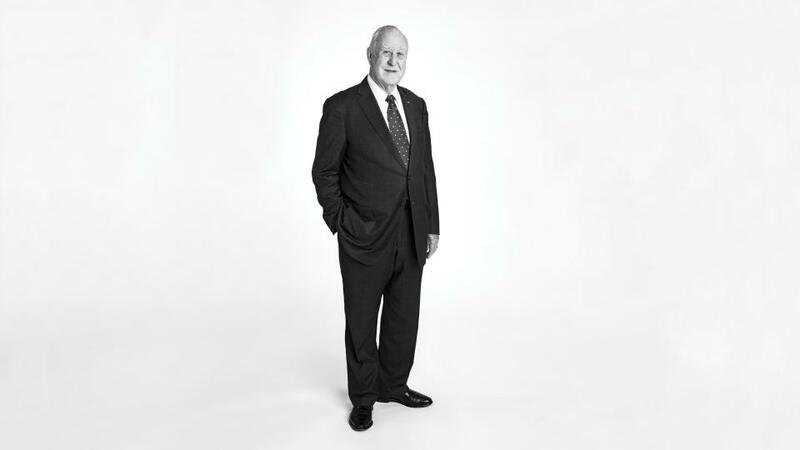 When John Germ takes office as Rotary International’s president in July, it will mark his 40th year in Rotary. In that time, he’s likely best-known for leading Rotary’s $200 Million Challenge, a fundraising effort sparked by a challenge grant from the Bill & Melinda Gates Foundation. Rotarians surpassed that goal in 2011, raising $228.7 million toward polio immunization activities. “I never questioned that we would raise the funds,” he says. “Rotarians have been so generous.” In fact, raising money for polio was one of Germ’s first leadership roles. The Malden Rotary Road Race was a tremendous success. We had a great turnout for our running base and an incredible cadre of volunteers. We want to thank the Malden Police Department and the Middlesex Sheriff's Office for keeping our runners safe along the course. The City of Malden has been an incredible host to our 5K and 10K races and we are proud to have the support of Mayor Gary Christenson who has run our race without fail for the last several years. We were very proud to honor a true Maldonian as our Official Starter. Former State Representative Christopher Fallon joined us at the starting line and sent the runners into the streets ready to set personal bests. Chris Fallon has been a strong, key community leader for decades and we are happy to see that he is still leading and playing a role in our community. Chris is only the second community leader to serve as our Official Race Starter, he joins Chief Jack Colangeli as Malden Rotary's Pace Setters! 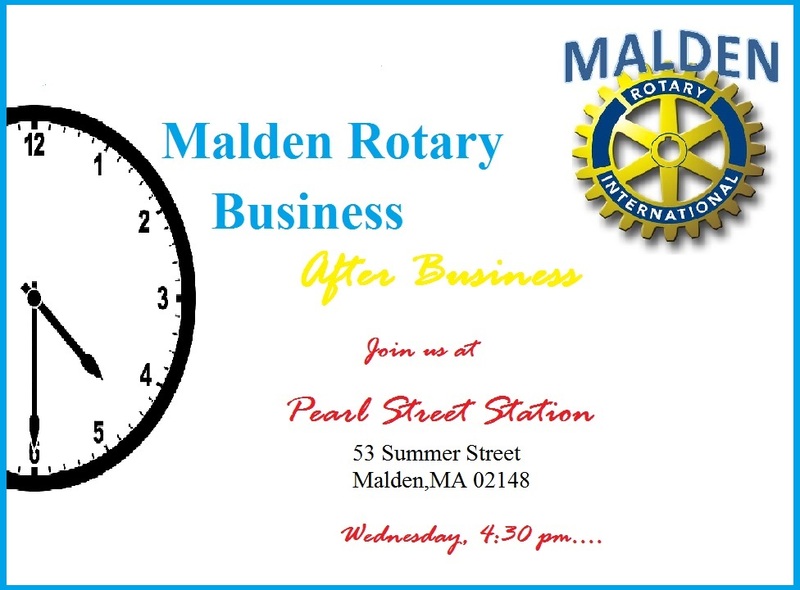 Want to be a part of Malden Rotary in our community, but cant make lunch meetings? Heard that is costs too much for membership? The Rotary Club of Malden is exploring a Satellite Club that may be an attractive option to be a part of a team that does great things for our community. We want to do more in the service of others, but in order to do that, we need you! 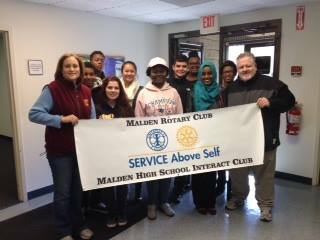 The purpose of the Rotary Club of Malden New Satellite Club is to accommodate the changes that have occurred in our professional environment and personal commitments. The primary aim of Malden’s Satellite Club is to secure the future of Rotary in the City of Malden as one of the premier humanitarian organizations in the world. If you would like to learn more contact mlawhorne@comcast.net. 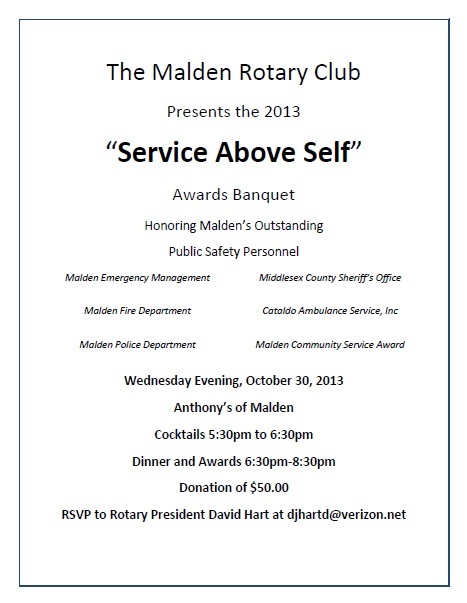 Join us October 28th at Anthony's of Malden as we celebrate our Community Heroes! Click on our calendar for more details! Boda Borg Questing Coming to Malden Soon! The CEO of Boda Borg Boston was our guest speaker at today's meeting. The Rotary Club of Malden is inviting the public to join them for an evening of baseball and friendship on Thursday, August 20th. The Malden Rotary Club embarked on a TWO Hour Cruise for the purpose of Installing our New President for Fiscal Year 2015-16, Paul Solano. The boat departed at 6PM sharp with a number of Malden Rotarians on board. First Mate Rick Burns was there to shove off on this new adventure up the Charles River. 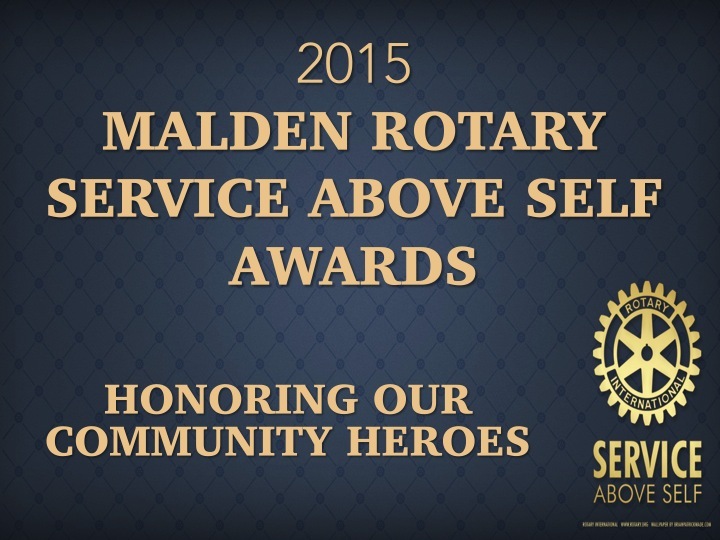 On January 7th, Malden Rotary recognized several heroes from the community at the 4th Annual Service Above Self Awards. The awards program honors people from our community that work selflessly to ensure our community is a safe and thriving city to live in. Malden Rotary honors members of the Malden Police and Fire Departments, the Emergency Management Center, Cataldo Ambulance, the Middlesex Sheriff's Office and a community service volunteer. 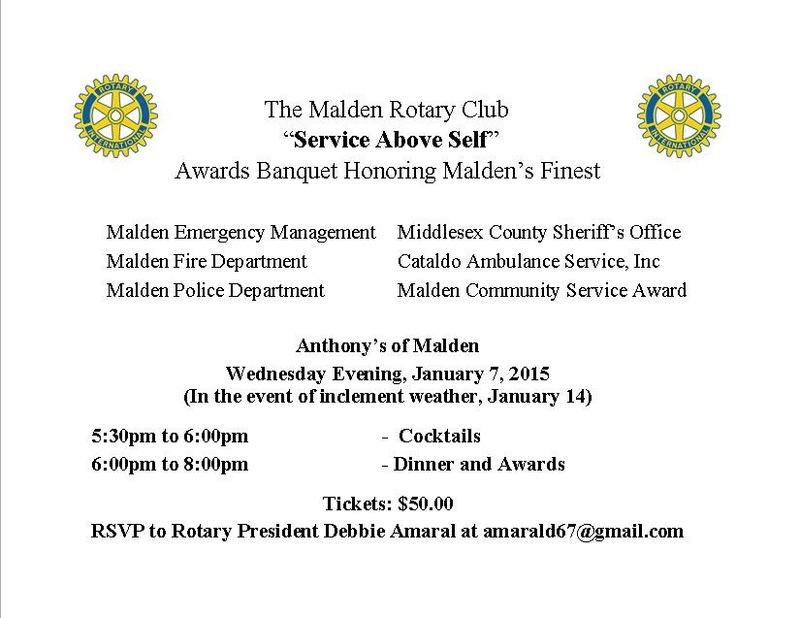 The Malden Rotary Club is hosting a “Service Above Self” Dinner on January 7, 2015. The Club will be honoring Community and Public Service Awardees from the Police, Fire, Emergency Service, Cataldo Ambulance, Middlesex Sheriff’s Office, and Community Sectors. The Event will be held at Anthony's of Malden on 105 Canal Street and begins at 5:30 PM with cocktails and at 6:00 PM for dinner. Tickets are $50.00 each. This Year’s Dinner will high-light two (2) recipients who extend far beyond our local Public Safety impact because their selection speaks directly to what we as Rotarians do in the world and why we are involved. This selection by Sheriff Peter Koutoujian speaks directly to our Motto of “Service Above Self”. 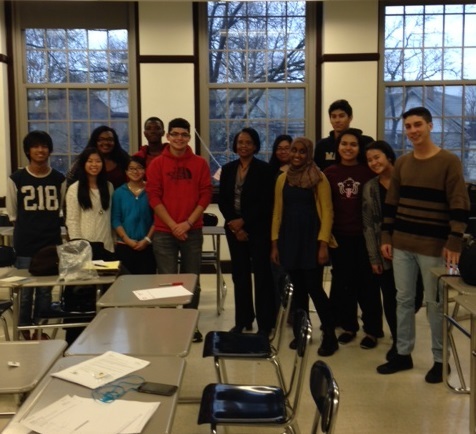 Recently Rotarian Liz Hart, our new InterAct Club Advisor, met with the Inter Act Club at Malden High School. Liz discussed the clubs priorities and their upcoming participation in this year's Polar Plunge. Along with the InterAct Club President Roberto De Oliveira, Liz presented pins to the new officers. Liz stated, "I am ery proud to be working with this great group of students who are interested in building their leadership skills while helping the community." Liz takes over the role as InterAct Advisor form her husband and fellow Rotarian David Hart. LIZ POWERS, A FORMER MALDEN ROTARY GRANTS SCHOLAR, CREATING GOOD IN THE WORLD! As a college student, Liz Powers wrote a thesis which explored the social benefits of art therapy programs. Upon graduating from college, Liz created art groups in women's shelters in Cambridge, Mass. She realized that there were many great art therapy programs in Boston, but the missing piece was an equally empowering method for the artists to share their artwork. The Malden Rotary Club held its annual Installation of Officers Dinner this past Wednesday, June 25th. Immediate Past President David Hart welcomed 2014/15 President Debbie Amaral. Deb who serves as the Malden YMCA’s Executive Director looks forward to leading the club with an eye on celebrating local non-profits and increasing the club membership. Malden Rotary continues to be a strong and vital partner to Rotary International. Our club has set a standard in District 7930 that demonstrates our commitment to support Rotary International and our District Governor. 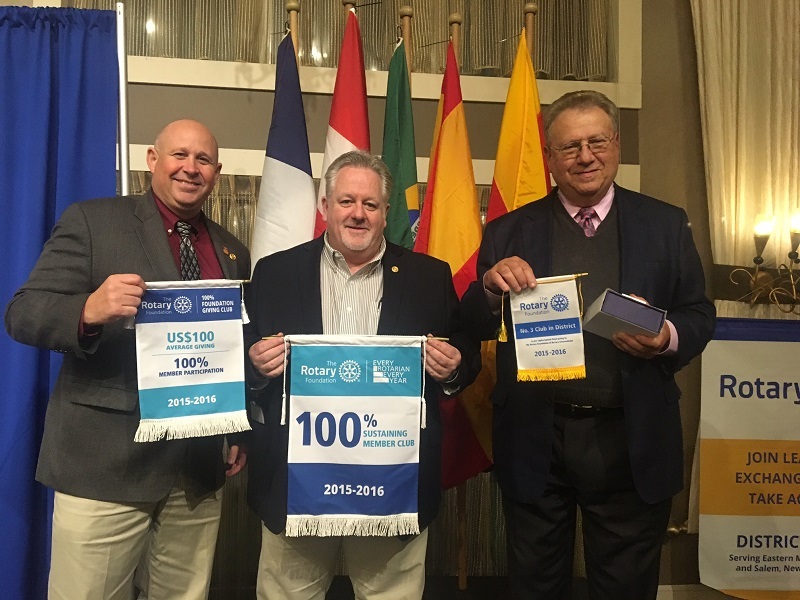 Our club recently received word from the district leadership that our club has achieved both "Every Rotarian Every Year" and Rotary Foundation's "Sustaining Member" status. Robert Gravino, District Foundation Annual Fund Chair said, "Congratulations! 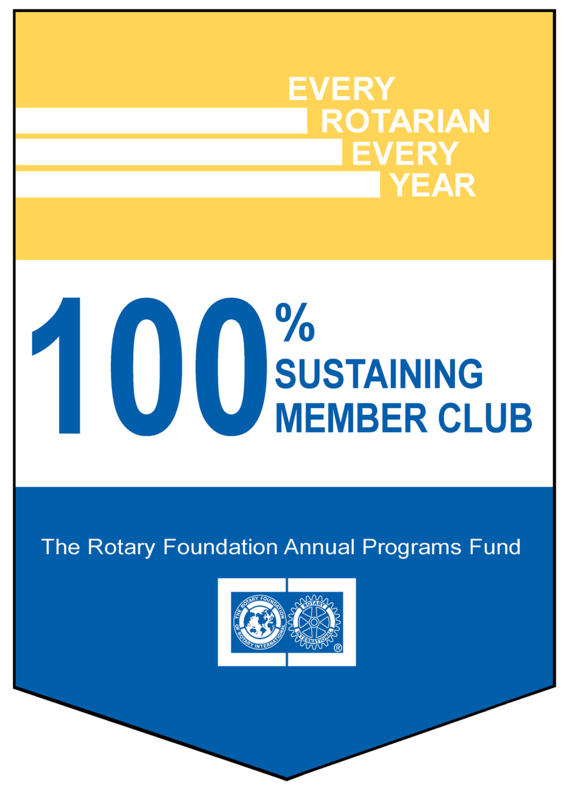 Malden has achieved both EREY and Rotary Foundation Sustaining Member status for the 2013-2014 Rotary Year. Nice job! This achievement means that I will have the pleasure of returning to your club early in the 2014-2015 Rotary Year to present Malden with two RI Banners, one for EREY and the other for RFSM." We look forward to Bob visit and receiving the banners for our cub's accomplishments. Bob also brought news of another club success and said, "The Malden Rotary Club have also met Governor John Hall's goal of achieving First Class status, whereby every member contributes any amount to the Foundation." Marion Bunch on The Power of Rotary from Rotary International on Vimeo. Help us eradicate Polio by joining with the 200 or so Rotarians, Interactors, Rotaractors and friends of Rotary to reach this year's goal of $100,000. Registration will be open by the end of the day on December 2nd and we will be using Fundraise.com again this year to asssist plungers with manage their donors and donations. Many new incentives will be announced shortly. Visit the Polar Plunge page for up to date information! Malden High School Rotary Interact Students, Zonta President JoAnne Puopolo, and Rotary President David Hart at the Hallmark Mobile Food Market. What a great cause and a great collaboration!!! Malden Rotary's newest member is sworn in by President David Hart as District Governor John Hall looks on. 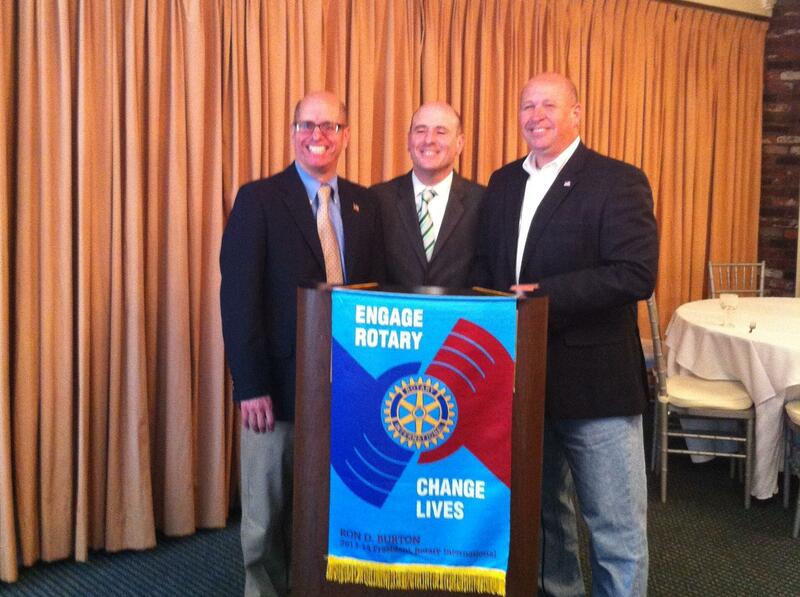 Malden Rotary would like to extend our gratitude to today's speaker State Representative Paul Brodeur.